A warm welcome to the Cobtree Scottish Country Dancing Group. If you are looking for Scottish Country Dancing in Maidstone you have come to the right place. If you came across our website by chance, you may just have stumbled upon the new hobby that you were looking for. 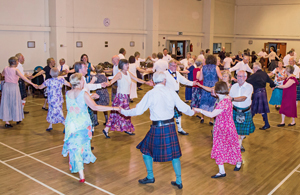 Scottish Country Dancing offers A Great Social Life, combined with both Physical and Mental Exercise as well as being great fun and Very Affordable. Our fees are explained on the Members' Information page. The Group meets every Wednesday at the Grove Green Community Centre in Maidstone from 7.30 pm. until 10.00 pm. You don’t need a partner, so don’t be put off from coming by yourself, several members of the Group started in this way. Scottish Country Dancing is a very social activity, and partners usually change for each dance. No special clothing is needed, other than soft shoes. Everyone is most welcome from all ages and dancing abilities. Even if you have never danced before, you will be given all the help and encouragement you need from some of the more experienced members.